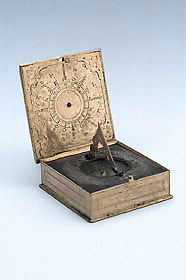 This horizontal sundial with compass and two volvelles is neither signed nor dated. The only indication of its origins appears in a wind rose where the eight classical winds are named in Italian. While this might suggest that the dial was of Italian manufacture or intended for use there, German instruments of this period also sometimes use Italian names for the winds.